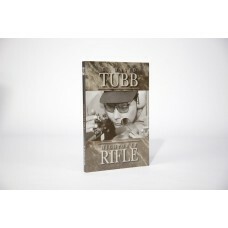 The undisputed rifle champion of all time: 11-time National High Power Rifle Champion and over 30 open, individual Silhouette Rifle National titles, G. David Tubb offers his insights and advice on equipment, shooting in the wind, rifle shooting technique, and, most importantly, how to apply a winning strategy. This book is one that we're extremely proud to offer for sale, let alone have produced. "This whole thing is a great experiment. My laboratory is my range and shop. My proving grounds are in Ohio [Camp Perry]. This book is the sum of the results I've had with Highpower rifle, to this point..."
G. David Tubb is the winningest NRA Highpower Rifle shooter in history. If we include David's long successes in Silhouette Rifle, his collegiate accomplishments in ISU, his recent string of victories in the Sportsman's Team Challenge and Masters events, he emerges as possibly the most accomplished shooter in history, having won some 40 national individual titles in many different forms of rifle competition. Highpower Rifle offers a rare insight into the inner workings of a self-made champion. While the book is designed so that even non-competitive shooters can work their way from the ground up, even the most accomplished competitor cannot "outgrow" this book. The subject matter is taken to extreme depth and detail. As such, anyone interested in shooting a rifle better will benefit . For instance, any varmint or benchrest shooter will learn a wealth of information on shooting in the wind and any hunter will be well advised to learn what David has to say about rifle-fitting and shooting technique. SPECIFICATIONS -- 208 pp softcover, 6x9 size, 100 photos and illustrations, very high quality printing.